The University of Delaware’s Special Collections Library has received the largest and most valuable donation in its history. The Mark Samuels Lasner collection of British literature and art, worth an estimated $10 million, was officially donated to the library last week. Samuels Lasner, legally blind and sometimes labeled the “foremost blind book collector in the world,” began collecting at a young age. His collection, built over 40 years, focuses on British literature and art between 1850 and 1900, with a particular emphasis on the Pre-Raphaelites and writers and illustrators from the 1890s. In total, the collection includes over 9,500 books, letters, manuscripts, photographs, ephemera, and art. Lasner has long been attracted to association copies. Notable signatures on items in the collection include those of Oscar Wilde, George Eliot, Charles Darwin, Max Beerbohm, William Morris, Henry James, Christina and Dante Gabriel Rossetti, Robert and Elizabeth Barrett Browning, and Aubrey Beardsley. Nearly 1,000 items alone relate to Max Beerbohm. Related events include a symposium titled “Celebrating the Mark Samuels Lasner Collection: Rare Books and Manuscripts, Victorian Literature and Art,” to be held March 17-18, featuring keynote speaker Elaine Showalter, and an exhibition, Victorian Passions: Stories from the Mark Samuels Lasner collection, currently on view through June 3. Samuels Lasner is a senior research fellow at the University of Delaware Library in addition to serving on the council of the Grolier Club. He has also written bibliographies on Aubrey Beardsley and William Allingham, amongst a host of other accomplishments. 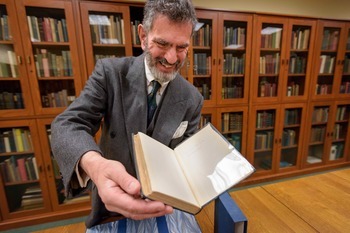 The University of Delaware's Special Collections Library has received the largest and most valuable donation in its history. The Mark Samuels Lasner collection of British literature and art, worth an estimated $10 million, was officially donated to the library last week. Samuels Lasner, legally blind and sometimes labeled the "foremost blind book collector in the world," began collecting at a young age. His collection, built over 40 years, focuses on British literature and art between 1850 and 1900, with a particular emphasis on the Pre-Raphaelites and writers and illustrators from the 1890s. In total, the collection includes over 9,500 books, letters, manuscripts, photographs, ephemera, and art. Lasner has long been attracted to association copies. Notable signatures on items in the collection include those of Oscar Wilde, George Eliot, Charles Darwin, Max Beerbohm, William Morris, Henry James, Christina and Dante Gabriel Rossetti, Robert and Elizabeth Barrett Browning, and Aubrey Beardsley. Nearly 1,000 items alone relate to Max Beerbohm. "This is a monumental gift that will be transformational for the University of Delaware," said UD Provost Domenico Grasso. "There's no collection quite like it in the world, and the benefit to scholars across disciplines and backgrounds is remarkable. Mr. Samuels Lasner's generosity will impact UD students and faculty for generations." Related events include a symposium titled "Celebrating the Mark Samuels Lasner Collection: Rare Books and Manuscripts, Victorian Literature and Art," to be held March 17-18, featuring keynote speaker Elaine Showalter, and an exhibition, Victorian Passions: Stories from the Mark Samuels Lasner collection, currently on view through June 3.